I know the Easter story. I try to comprehend the significance of Jesus’ resurrection. But I’ve never thought about how Matthew 28:1-10 also has much to say about dreaming. Two Marys were at the tomb, but they weren’t there expecting a miracle. They went there because of obligation and tradition. Somebody needed to put oils on the deceased’s body to prepare it for burial. But God surprised them. A stone was moved not because Jesus needed it to exit the tomb but so these women could see inside. They witnessed the miracle. “The women left the tomb quickly. They were afraid, but they were also very happy. They ran to tell Jesus’ followers what had happened” (Matt. 28:8). Of course, dreaming is scary, but it’s also joy-filled beyond our imagination. And that makes us want to proclaim the good news – The Good News, especially – to others. Jesus told the women they didn’t need to be afraid. And he told them to go. “Then Jesus said to them, ‘Don’t be afraid. Go and tell my followers to go on to Galilee, and they will see me there'” (Matt. 28:10). Making the phone call. Sending the letter. Accepting the job. Booking the trip. Serving in another country or on your street. All of that can be scary, but God may have a surprise waiting when you least expect it. 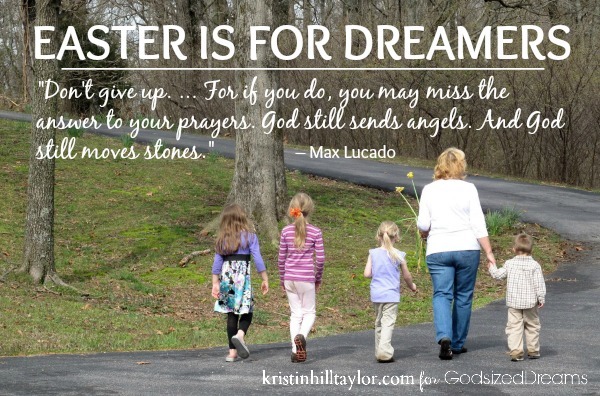 Join me at God-sized Dreams today to read more about why Easter is for dreamers. I’m linking up with the Soli Deo Gloria Sisterhood Gathering, where encouragement happens. Praising God for His miracles…for reminding me that I need not be afraid…that I can say "yes" when He calls me to Him and His purposes…and say "no" when He directs me in that way. Easter reminds me that my life has been resurrected in Christ, because of Christ. Easter is year-round! Praising Him and thanking you for your words. Thanks for being here, Linda! Beautiful reminder! Thanky you, Kristin! You're welcome, Joanna. Glad you were encouraged.